As a runner, you have to face the truth about yourself on a regular basis, and it makes you more honest. You can’t pretend to be faster than you are. You can’t pretend that you are better prepared than you are. You cannot pretend to be a runner, you actually have to run. Suddenly, when the run itself is the goal, there are no more bad runs. Suddenly it doesn’t matter if we don’t finish within our goal time — or don’t finish at all. What matters is that we tried, that we enjoyed the process. What matters is that we got out there. I haven’t done a shoe review in quite a while. Mostly because I haven’t been jogging much the last couple of years. The spirit has been willing, but the heart (and various other parts) have not been entirely cooperative. 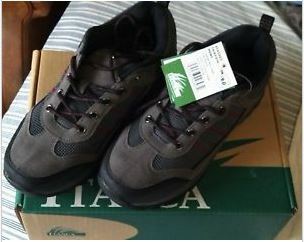 Be that as it may, this is my review of the “Itasca Fairview” hiking / walking shoe. 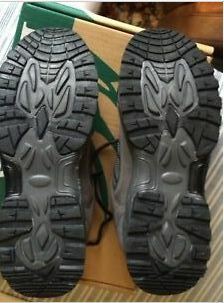 It can be used as a “heavy” / off-road jogging shoe if you don’t mind a stiff and knobby soled shoe. I don’t. I purchased this because I prefer a hard wearing inexpensive shoe. First, the price was very good. It was on sale at my local Big5 Sporting Goods store. I was able to find my size (14) and it was wide enough for my “dogs”. I have “paddles” for feet (much wider toe than heel area), so normal running shoes, which tend to the narrow fit, don’t really accommodate my feet. As I began jogging a few years back with a mid-sole strike, my arches changed and I became no longer able to wear many of my older shoes. My left foot (arch) in particular bars me from wearing size 13 shoes and most size 14 slip-ons. I found these shoes very comfortable for my slow and steady jogging style. I started off with a 1 mile jog and by the end of about 6 weeks I was consistently jogging about 4 miles a day. Enough to get my 10K steps goal on my Fitbit. All in all, I would estimate I jogged fewer than 100 miles during the pairs use and, if you add in another 50 (generous) miles for cool-down walks, I’d say the shoes were blown out by 135 to 150 miles of use. By way of comparison, a good running shoe will probably cost you about $80-$120, and it is recommended you replace them every 400 miles or whenever they feel like they’ve lost their sponge under your forefoot. So, the price I paid was about 1/3rd of a running shoe and the use was about 1/3rd. I guess that’s considered equal value for relative cost. Another significant factor on the shoes use is that I am extremely heavy (350+lbs) and therefore very hard on soles. 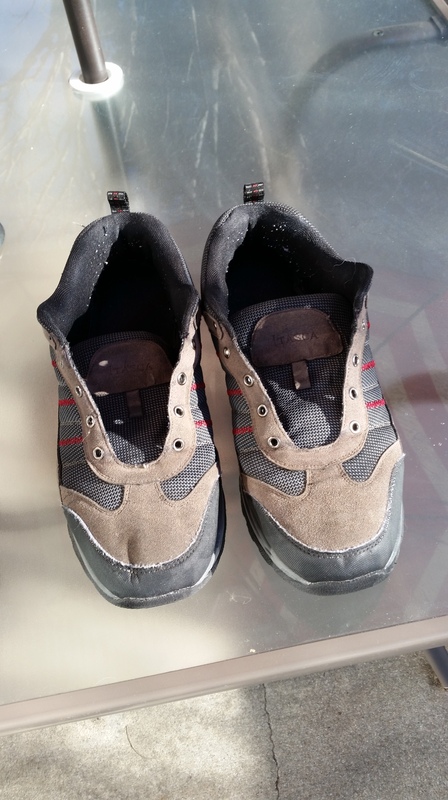 That is part of why I look for stiffer shoes with heavier tread – they tend to take a beating better than normal running shoe models. Of course, the trade-off is you have to jog less upfront when the shoes are newer so you can break them in without giving yourself horrendous blisters. After use: You can’t really tell from the image, but center forefoot is completely worn through to the sponge padding under the forefoot. The tops, on the other hand, were practically without blemish. From the start, the shoe felt like I was jogging with a pair of wooden slats under my feet. Again, on the other hand, the tops were very comfortable (once broken in), even when tied tightly. Had the soles lasted another month, I would say the shoes were a very good value. As it is, the best I could say was these would be good value (at sale price) if you were either normal weight or were only going to use them for actual hiking / path walking on the odd weekend out and about. 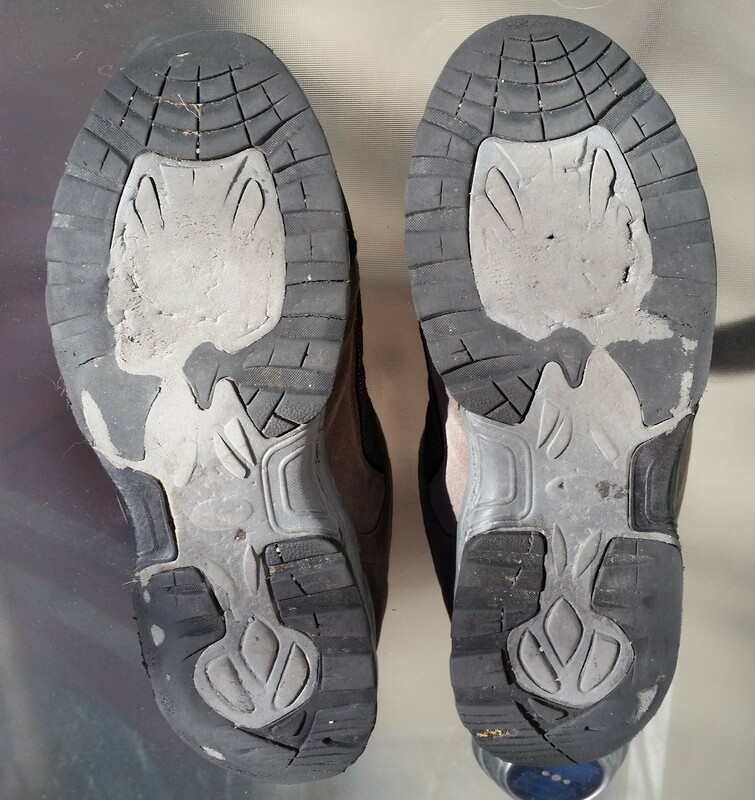 If you look at the “Soles after” image, you’ll probably notice a lot of outer heel wear and some “tippy-toe” wear. The heel wear is from the daily walking where I do a lot of heel striking. The toe wear is because I seem to push-off a lot when I do my jogging. I should clarify. I don’t “really” jog. I would describe it as slogging (“slow jogging”) – basically, a little faster than walking with a jogging / shuffle motion. In general, my heels wear out on my walking shoes, my forefoot wears out on my jogging shoes, and the top wears out if I try to get the comfortable light-weight mesh uppers common to many true jogging / running shoes. Final recommendation: reasonable value for the price (I paid). I went back to Big5 to get another pair. Like most “sale” items at this type of discount store, “my” store no longer carries this model. I also looked on-line and Itasca no longer manufactures this model. It turns out other Big5 stores in my area do carry this model, but the current price is almost double what I paid on sale. At that price, I leave them on the shelf… I can find “real” running shoes for that price. We were not designed to stand still. If we were, we’d have at least three legs. We were designed to move. Our bodies are bodies that have walked across vast continents. Our bodies are bodies that have carried objects of art and war over great distances. We are no less mobile than our ancestors. We are athletes. We are warriors. We are human. Well, at long last I got back on the pavement!! This morning, I forced myself out of my nice warm bed, strapped on my Keds and went out to pound some pavement. The sun was just up. The sky was cloudless and clear blue. The frost was everywhere… Despite my doubts and the persistent questions (“Why do you keep doing this to yourself?“), I managed to slow jog around the block three times (1.2 miles total according to Google maps). This was my first time out doing anything other than walking my dog since mid-November when I had my electrical cardioversion. I felt terrific, like I could go forever… But tomorrow is another day. I finished with a cool-down walk of my dog – for another mile. All told, about 45 minutes and 2.2 miles. And so it begins again (I hope).